This topic contains 41 replies, has 6 voices, and was last updated by Coffeecurlygirl 8 months ago. Good Monday morning, why do all of my efforts start Mondays? I love and hate Mondays. Good day to start things and well it’s Monday. I’m in my 40’s and started putting weight on…argggg! I’m short so I feel like it’s very obvious! I’m going to have Monday and Wednesday’s as fast days. The weekends especially in summer are tough for eating perfect. I love healthy food and well…. chocolate. So I’m looking for ways to cut cravings and stick with this amazing plan. Please help??? Dizzy girl here! What’s normal???? So I did my fast day for the first time. I was not hungry at all, I had lunch at 12:30 which was cottage cheese, Blueberries and crushed pecans. My energy was pretty good, until 4:30 I tanked. I had a small omelette with plum slices, staying around 500 calories, about 465. Now I feel very light headed. I drank tons of water. I’m wondering if I’m low on electrolytes? Will I feel like this on every fast day? Next time when you fast is going to be much better. And then next week much much better and so on. It’s getting easier in time. In about two weeks maximum four you’ll have no problem at all. No light headed, no migraines nothing like that. I felt exactly like you but now I’m good, no problem at all during the fast days and I’m in my 4th week now. Plus you’ll see, in about two weeks you’ll start to eat less even on the non fast days. May I use Ccg for short? You did your first FD well. The lightheadedness could be a slight lack of salt. When we eat less food we aren’t getting the salt or fluid contained in the food we didn’t have. Therefore we need more fluid and sometimes a little extra salt. A 5:2 hack – wet just the tip of your finger, I just lick it, and dip it in salt and have that. Do you have chronic fatigue or Myalgic Encephalomyelitis/Chronic Fatigue Syndrome.(ME/CFS)? If you have ME/CFS then you may need a little extra salt anyway. You can lose your excess weight with 5:2 Coffeecurlygirl, and after you get the first few weeks done you’ll have worked out the basics, and it will not feel like dieting. A couple of us here have ME/CFS, now maintaining, after losing our excess weight without exercise that would be detrimental to us. I lost 46lbs. It goes a bit slower than those who can exercise, but what is commonly seen here on the forum is that it’s what you do with food that loses the weight, and exercise is about health rather than weight loss. Stay on the forum and you’ll see your questions answered and your weight go down. I’m back on the 5:2 wagon – I followed this way of eating before my wedding back in 2016 and managed to get some inches off my measurements and felt great on my wedding day. However, for all manners of reasons I didn’t keep it up, and in fact my eating habits turned terrible during 2017 and the first part of this year too, so I’m back on the forums and have become a lot more mindful of what I am eating. I found the light headedness did get a lot better as my body got used to fasting previously. I also wasn’t eating enough salt on my FDs too, and realising that really helped with any ‘heady’ feelings! I’d sometimes have a Miso soup to help with that. Really well done for getting through the first fast day! I’m doing my first FD today in over a year, so reading the comments above in the other replies has helped remind me of what to do for the best. Thank you so much Melilotus, Merryme andbabs_b!!! I love all your words of advice and help! I do have CFS, not fun at all. I did some reading and found the suggestion of more salt very helpful. I pinch some Himalayan salt into 4 oz of coconut water, which was my last 40 calories. I felt so much better! I even went for a brisk walk after. I’d say not eating was pretty easy it’s just the feeling of being really lightheaded was concerning. This morning I weighed myself, lost 3lbs of most likely water weight! Still feel lightheaded even after coffee and breakfast, which is strange because this not a fast day. Have you experienced any of that? So awesome to read your success in losing 46lbs Merry! Also, babs_b…getting back on the wagon is the first start, I feel the same way! Melilotus…it’s encouraging to see you went through the same thing and it went better! Coffeecurl, taking up Fasting is the right move. We started 5 yrs ago, got to the weight we wanted, and continue to Fast 2 days/week. it works. You can do it. My husband used to feel odd after breakfast on the day after a Fast, tho he doesn’t anymore. I chalked it up to having low carbs one day, then lots of carbs the next meal. As I said, he got over it. You are correct to eat protein on a Fast Day, as it helps you to feel full. Thanks for your words of encouragement! Can I ask what you did for eating on non fasting day? Did you eat whatever or kept calories under an amount? I don’t want to sabotage my fasting days with bad eating on days off of fasting. We have developed a regular pattern of eating, so that we have certain types of foods on certain days. it simplifies our lives to preplan. So if I say we have pasta every Wednesday, we might have 20 recipes to choose from, not the same one every week. What do we eat on Slow Days? Sun: Pancakes or special Coffee-cake with chicken sausage for breakfast; roast chicken or lamb or pork with all the trimmings. Mon: Fast Day. Tue: coffee-cake with fruit yogurt and bacon for breakfast and Sunday rework for dinner. Wed: High fiber, high protein Cereal + fruit for breakfast, Pasta with sauce [husband used to eat 2-3 oz pasta to my 2 oz. now he has 2 oz pasta and I enjoy 1 oz] plus veg and bread for him. Fri: Baked goods + fruit yogurt and Canadian bacon for breakfast, fish for dinner with rice [not much for me] and veg sides. Sat: Cereal + fruit for b-fast, personal-sized home-made pizzas for dinner. We drink wine on Slow days with dinner. How are you getting on? I’m in my second FD this week – Tuesday was a success and it’s just so bloomin’ hot again that I barely feel like eating today…. so at least the weather is helping in some ways! When I was following 5:2 last time, I ate whatever I wanted on non-fast days and still lost weight. However, I was always so surprised at how I wasn’t hungry the day after a FD… I really was expecting to be starving, but very rarely found that was the case. I was also a bit concerned about just eating whatever I wanted on NFDs, but it really didn’t stop any progress. I started off at around 10 stone 6 and lost a stone – most of that stone was lost in the space of 2 months too. As fasting_me said, I was aware of my TDEE and just tried to mentally tot up roughly the calories I was eating most days but I never tracked them, and never stopped myself from having a ‘treat’ too. However…. I started to find that if I’d had a day of pretty rich eating, I would actually look forward to my Fast Day to help ‘reset’ my body a bit! Ccg, some people find that carbs [starchy ones] are an eating trigger and make them hold on to weight. That has not been a problem for me [except for white rice which I avoid]. You said you were leery of eating carbs on Slow days, so you might want to see if they affect you. Then you’ll know if you are OK or if you need to reduce them. Fasting today: Eggs with Welsh Cheese & Leeks for breakfast. Strawberry-Chicken Spinach Salad for dinner. fasting_me, your food sounded lovely yesterday! I had a couple of courgette & butternut squash croquettes mid-afternoon, then had a little bit of left over chilli from my FD on Tuesday with loads of salad (no dressing of course) last night. Other than that, I spent the day drinking what felt like gallons of water! It’s lovely to have a good summer, but man am I looking forward to a couple of days reprieve now?! Ccg, I’m sure you’ll see a little movement on the scales even with the carbs. Of course, everyone’s different as fasting_me said earlier, and some people tend to respond to carbs differently but hopefully you’ll be absolutely fine with them. I’ve just weighed in after my first week and pleased with the progress. Onwards and downwards! I agree to much carbs usually affects me, I get all puffy and retain water. I know eating to much protein gives you high enzymes that in the long run can be damaging, so I’m just trying to find a balance. I do love salads and protein, it keeps me fuller and more satisfied then carbs. I do like the suggestions you had with fast day. I love your strawberry spinach salad. I just love this time of the year with all the fresh produce. It makes it easier to start this 5:2 fast. Today I’m starting my second fast for the week. I’m planning on not eating until 1, I find I’m hungrier if I eat start eating earlier then that. I’m also going to sip on chicken broth today as well, to avoid the lightheadness, that was very unpleasant on Monday. It’s been a full week with relatives staying with us, so I’m looking forward to this fast, keeping busy cleaning my house getting it back in order and drinking tons of water! I’m planning on having cottage cheese with berries and pecans again for mid-day and some type of salad for dinner. I think I’ll make your spinach, strawberry chicken salad😉 thanks for the great idea! I’ll keep you posted how it goes. Babs_me…Great job on your fast! Awesome you lost weight this week!!! Do you weigh in once a week? I’m personally afraid of the scale, it tells me bad things..lol…! I’m planning on once a week. I’m afraid with eating different then FD the water retention will show up? Anyways have a great weekend! Ccg, I’m guessing you didn’t weigh yourself before you started Fasting… Lots of people are reluctant to know what they actually weigh. For me, I want to know where I started so that I can see how much progress I’ve made. At some point, do weigh in so you will have a comparison. Your once a week sounds reasonable. It is great to see the number go down! Sometimes they blip up for a while, but we know that a few good Fast days will set that to rights. As for water retention, wouldn’t that come only if you were eating too much salt? Just curious. Not something I worry about. @fasting_me. For every gram of glycogen (stored glucose) you have about 4 grams of water retention. Hence the initial rapid weight loss when people start fasting. You are depleting your glycogen and hence shed a lot of water. After this initial burst the slower weight loss is more likely to be fat. While salt does play a role its really quite minor. Thank you that makes more sense. I fasted yesterday and ate berries with cottage cheese for lunch and artichoke, sundries tomatoes omelette for dinner. I also made sure to do the salt thing, along with tons of water. Which made me feel better then my first fast. Only a little lightheaded and tired. I weighed myself again this morning, so total for this week has been 3 lbs! So I’m guessing next week it will slow down a bit. That being said, I feel great! Not a bit tired or lightheaded like I was with the day after FD like last time. Yeah!!! Yes Ccg!! – really good work on the 3lb loss! I shed 2lb last week. Good work on the Friday fasting too, on so pleased it was a lot better! 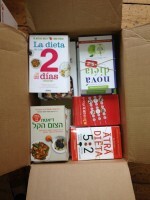 I ordered a couple of the fast diet books last week (the summer fast diet book an also the official 5:2 recipe book). I typically just make a low fat chilli and eat that with loads of salad leaves on my fast days. It’s what I used to do last time, but I’d quite like a bit of variety on my FDs over the coming weeks and months, so hopefully will get more recipe inspiration from the books. It’s been a pretty indulgent weekend for me, as it was my sister’s birthday. So just drawing a line under that and carrying on with the 5:2 routine this week. Fasting today (Monday) and 2nd one will be Wednesday. I find only having one day in between fast days seems to somehow make the second one easier. Though it is nice to have the flexibility to throw a fast day in anywhere in the week! Good job on your results last week! I am also fasting today as well as Wednesday. You had a party this weekend and we had a bbq at our house. Gatherings are so hard to eat well. Yesterday wasn’t much better, left overs. So today will be good! I was thinking I need new options for fast day. I should get some recipe ideas. Especially like you said…to keep this up for the long Hall. Let me know if you like your books you ordered. As far as energy, are you feeling better? I noticed outside of yesterday…because of getting up at 4 to leave town. I feel more energized then normal. But I’m also done with my period. So hopefully in the weeks to come my energy will be consistent. Hi, so I did my fast day today. It went really well. I took the kids to amusement park, so I had cottage cheese and berries for brunch around 12:30. We didn’t get home until 7, I had skinless chicken breast in crockpot, so I made retried beans, and made a taco salad, with salsa, 1/2 serving of tortilla chips crumbled on top of a big bed of lettuce with a pinch of shredded cheddar cheese and 1 tsp of ranch dressing drizzled on top with a grand total of 375 calories. I had energy today and didn’t really feel hungry, even when we stopped for ice cream, I had a diet soda. Then my husband and I went for a walk and made my steps today as well. This is all very surprising for me to have energy! I hope it last. I also did my FD yesterday though I have a leg injury at the minute which is scuppering my walking plans. I’m having it looked at today so hopefully it’ll settle down this week. I’m in a ‘workweek hustle’ challenge on my FitBit with some friends and their friends – I’m so competitive, I don’t want to come last, so need to get my steps up!! I was a bit peckish at lunch time yesterday but didn’t have too much in the office, so I made myself a protein shake. I ended up working quite late and didn’t get home until 8pm or so, so I cooked up and egg with mushrooms, tomatoes and spinach and some smoked paprika for flavouring (I love chorizo, so smoked paprika gives me that flavour without the cals of chorizo on a FD). bigbooty, thank you for the intelligent explanation. I can always count on you for good advice. babs & Ccg, look at my profile for the address of my blog where I have LOTS of recipes for Fasters so you can have some variety. Nothing to sell, just recipes. Great job on your weight losses! Well done. @fasting_me – thank you, your blog will be a great help – really appreciate it! @babs_b so sorry to hear about your leg injury:-( very frustrating especially when you set your mind to get healthy. I hope you heal up fast.. So we are starting another fast day! We can do I! Right now I’m not hungry, but a bit tired today. I feel loved me I need to set my mind to cut sugar on non fast days. I can handle the 2 fast days no sugar or carbs. But I know in order to feel good all the time, I need to watch my diet all the time. Summers hard with kids…your fast meals sounds so great with your spices. I need to try that! Thank you! Fasting_me thank you, I will check it out! @coffeecurlygirl – thanks, the leg isn’t terrible but turns out it’s all stemming from a disc issue in my back. I prolapsed a disc a few years back in my mid 20s, so I’m going to do everything I can to stop this other one going the same way. I didn’t know then what I know now, so I’m hopeful I can stop it in its tracks a bit. I’ve booked onto the pilates class at my gym tonight, and will be cancelling my place at the Zumba class this weekend to avoid any unnecessary high impact. Such a shame, I love Zumba – but I love not having back pain more. How did yesterday go? I ended up going to the cinema last night with my SIL and niece – I didn’t eat anything through the day and saved my calories for a small bag of salted popcorn. It worked a treat!! Movie was massive distraction from wanting to eat more, and I knew I wasn’t going over my cals with the popcorn because I’d checked it out online before I went. 1lb off this morning from last week and 1/2″ gone from my waist and hips (and my low waist, which is where I carry all my weight, but the tracker online here doesn’t have that as a measurement). I’ve joined in on the August challenge on this forum too, to keep me in check! I totally recommend spices and herbs with fasting meals – they really help lift up the flavour and save on calories. Smoked paprika is a revelation – for years I was just using normal paprika (which still has its place), but since I discovered the smoked variety, I use it in Chilli, Spanish chicken, Jambalaya etc. It’s great. @babs_b my brother has had over 4 back surgeries over the years. I can’t even imagine the pain with all that. I don’t have that problem, but 2 of my good friends do. It’s very immobilizing for them, so sorry not fun at all. I have double joint issues and at the moment my hip is out because of over stretching. Frustrating. Good job on losing inches and weight. I’m a little discouraged because I only lost 4 oz this week! After fasting, you would assume it would be more. Was it because I lost 3 last week? Maybe I should do the August challenge, I didn’t notice that. What is it called? Maybe I should add another fast day for the week, not sure. I’m only 5’3 so maybe do a strict 1200 calories the rest of the time. We also went to a movie this week…on a non fast day, I still only had a small popcorn. Maybe the sodium was to high and I did lose much because of that. Just trying to figure it all out. I’m not giving us! @babs_b so I took your example and re-measured myself. I lost anywhere from a half inch to an inch across the board ! That’s crazy how you can lose inches and not much weight, but I’ll take it! I’ll that a success!! Hi! So I made it through my fast Monday. I didn’t eat until 12:30….I cut up a cup of cauliflower and chopped very fine, onion, dill, boiled egg, mayo and mustard, and made a egg salad lettuce wrap totaling 200 calories. I find when I eat more nutritionally based food, I’m more satisfied and don’t crave bad food so much. Then my family and I went to my parents to bring a meal and have dinner together, I thought it would be a challenge because my mom pays attention to everything I do or do not eat. So I brought fixings to make tacos or taco salad. Everyone was so busy making tacos that my small salad wasn’t even noticed. Iceberg lettuce looks like a lot of food with veges on top and meat, when in reality it was only 250 calories! I also bought Dill essential oil, it is suppose to cut sugar cravings. On my non FD’s I’m finding that my sweet tooth really has gotten worse. So that’s what I’m trying for tomorrow! Hope it works! How did your fasting go? What tricks do you use to stop cravings? Keep up the good work, Ccg! How clever you were with the taco dinner! Brilliant! Good advice about measuring, babs. When we began, we measured. Now we still measure and record it on our Fasting Anniversary, just to see if we have slipped or improved. Fish Tacos: 266 calories 2.6 g fat 3.6 g fiber 23 g protein	37 g carbs 118 mg Calcium PB The food truck staple is now available for a Fast Day. Add more spices to suit your taste. @coffeecurlygirl – well done on the FD! I managed yesterday though it seemed a lot more a struggle yesterday. I wasn’t too hungry either, but it was a real mental challenge yesterday. Still, I persevered – I didn’t eat any food until 7pm or so. I cooked up a chilli (the ol’ FD staple!! ), and had it with salad and 2 spoons of rice (desert spoon). Because I didn’t sail through with no negative thoughts, I somehow felt like I’d failed at fasting yesterday. However, I’ve reminded myself that I did actually successfully fast! Babs_b Good job on FD! You did it, for some reason mental fights are the worst. One of my best friends also was struggling yesterday as well. I think it’s also hard when we approach the end of summer. I hope your day goes great! The fact you succeeded despite struggling….that’s real success!👏🏼👏🏼😉. My new goal for the week is to skip breakfast which will give me a 18 hour fast, making lunch my first meal everyday. The scale isn’t moving much so I’m hoping that will help. Good going, gals. Keep up the progress and good thoughts. I was the same this week – I stayed the same on the scales but when I measured I had lost 1/2″ on waist, hips and bust. Pleasantly surprised at that. I seem to remember this happening last time I started the 5:2 – the weight didn’t drop for a week or two but I ended up getting smaller. So glad to hear that this is a, bit of a normal thing. I do need to watch my sugars, also I’m in my 40’s so metabolism is kind of on the slow side. Good job on your measurements!👏🏼I’m reading how measuring is the thing to do. I also decided to measure my thighs because all my weight is more on my lower half then top. I have a skinny neck so I know this is measurements is most likely for men. Ccg, here I am encouraging you. Fast Day tomorrow? go for it. What will you eat? Think ahead. Emotional Eating is something that the Fast Diet will not/cannot cure. Since it comes from the individual’s own past and patterns, it must be solved/resolved by the individual. If/When you work out the ‘why’ of the eating, you will be stuck with it. Good luck. Yeah, thighs are one of the things I measure, since that’s where I store the fat. Thank you, I tend to be an emotional eater at times, which then I loose my focus. Usually over frustrations. I’ve been encouraged to journal so I can figure out exactly why. Thank you for the reminder. But yes, I did a fast today with a 5 hour eating window. Tomorrow will be another day to sink in my resolve! I’ve listen to several podcast on fasting today to keep my excitement up.